We get out of the car after a bumpy hour and a half ride down the winding canyon road, stretch our legs, and reach toward the morning sun. Another beautiful day, another amazing adventure. We meander through a web of sycamore tree roots toward the sound of running water. Getting closer. No second thought about it, as soon as we see that vibrant turquoise stream, we strip down to our suits and jump right in… Salvation! Just a twist, turn, and a hike away from Sedona you will find Fossil Springs, a beautiful spring fed creek at the bottom of Fossil Canyon. Once you reach this bright reviving oasis you will rid your mind any notion that Arizona is just a blazing, dry, cactus covered desert. Once the paved road ends, the drive can be a bit daunting for inexperienced drivers. The road is rocky with a steep drop off in a few sections. It is best to have a high clearance vehicle; four-wheel drive isn't necessary but it helps. From Sedona, head south on Hwy 179. Turn right to merge onto I-17 S toward Phoenix. Take exit 287 for AZ-260 toward Cottonwood/Payson and turn left. Turn right at Fossil Creek Rd. Drive for 13 miles and turn right on Child's Power Rd, a slight left, and arrive at the lower Fossil Creek. There are two main entry points from which to enjoy fossil creek. If you want to head straight for the water with minimal hiking, it is best to park in one of the lower parking lots and hike along the creek. There are a number of inviting pools along the trail to the first large waterfall. 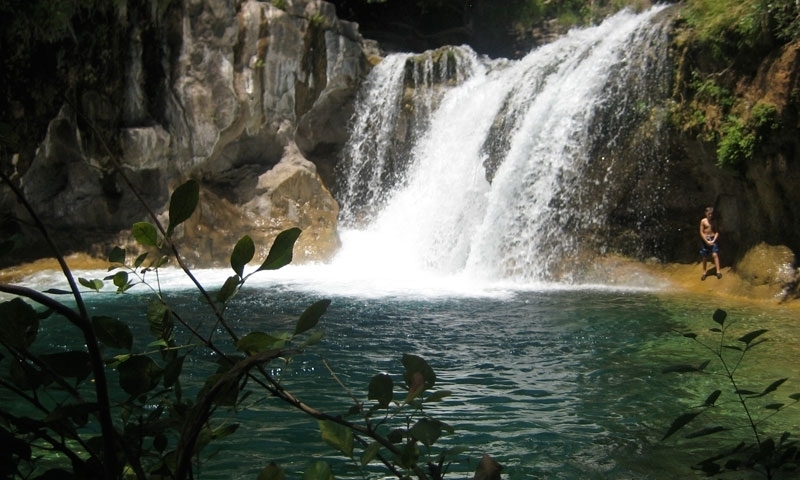 The waterfall is a popular spot where you can jump from the top into the below pool or try out the natural rockslide. A second option, and a bit of a hike, is to park at the upper parking lot near the trailhead. This scenic 3.5 mile hike down into the canyon offers beautiful views of the Mogollon Rim and the Fossil Springs Wilderness. One you reach the bottom of the canyon you are greeted by red sandstone flats in which the creek runs over. From here you can continue to follow the trail through a lush sun dappled forest alive with interesting creatures and colorful wildflowers. After about 3 miles your will come to the upper waterfall. This lesser visited spot is great for a peaceful day of swimming, sun bathing, and free climbing. Fossil Springs is one of the most diverse riparian areas in Arizona, with hundreds of different species of wildlife that depend on this lush oasis environment for survival. The increased number of visitors to Fossil Springs over the past few years has lead to increased damage to the habitat due to foot traffic and waste. There are no trash receptacles in the canyon, so please remember to bring trash bags to carry out anything that you bring in, and perhaps an extra one to carry out what others have left behind. It is important that we keep Fossil Springs bright and beautiful for the wildlife, for ourselves to enjoy, and for future to explore.